The apostle Peter understood suffering from identifying with Jesus and his years serving the fledgling church. Sometimes his suffering was self-induced, caused by his own mistakes. The simple, rugged fisherman failed when he took his eyes off Jesus while walking on the water. Peter even denied Christ during the last few hours before the crucifixion. 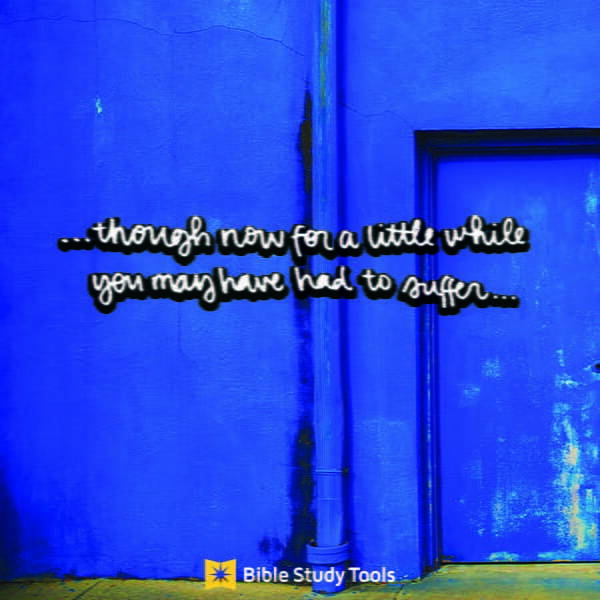 Despite all this, Jesus never forsook Peter, and God used these experiences to mold him. When we endure pain, most of us doubt God’s love, or even question our salvation. Peter reminds us that suffering isn’t punishment from God. It is temporary. Even though God didn’t cause the pain, He will refine us through it. If Job and Peter could find purpose in their pain, then there must be something to what they are saying. The mystery of suffering is never fully expressed. But it does seem that suffering leads us to pray more—whether out of anger, protest or petition. And thus, in the midst of tragedy, our relationship with God can improve. Above all, Peter wants us to remember that we are not alone. When we cry out to Christ, He understands our pain and weaknesses because He endured the same thing. One day, our suffering will end. We will be united with our suffering Lord and those who came to know Him because we suffered well. Suffering does not last forever. Not only do we follow Christ’s example by suffering, but we also follow in His resurrection. One day, God will raise us up out of our suffering. Adapted from an article courtesy of Bible Study Magazine published by Logos Bible Software. Each issue of Bible Study Magazine provides tools and methods for Bible study as well as insights from people like John Piper, Beth Moore, Mark Driscoll, Kay Arthur, Randy Alcorn, John MacArthur, Barry Black, and more. More information is available at BibleStudyMagazine.com. Originally published in print: Copyright Bible Study Magazine (May–June 2010): pgs. 29–31.